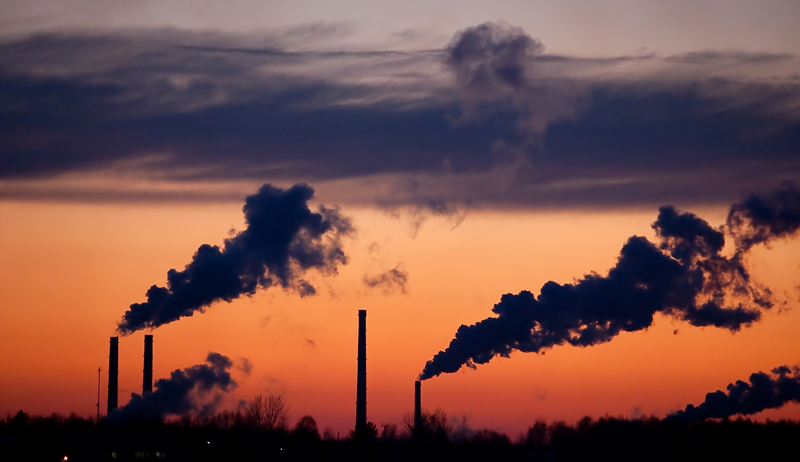 Coal-burning power plants are one of the primary sources of soot emitted into the atmosphere. PNNL researchers are looking into how soot affects cold clouds and ultimately, precipitation and Earth’s energy balance. Their work, from laboratory and field observations to imaging to modeling will help clarify how emissions impact the climate and our understanding of the role of clouds in the climate. Enlarge Image. Those airy, wispy cirrus clouds you're contemplating could be concealing a dirty secret. High in the atmosphere, these icy clouds can take on traveling soot, expelled from diesel trucks, ship boilers, forest fires, and fireplaces. What eventually drops from the cloud's sooty load may affect the destiny of snow-capped peaks and frozen glaciers in the Arctic. 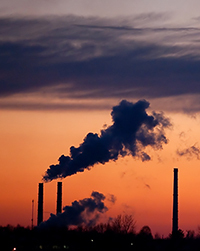 Results: In research led by Pacific Northwest National Laboratory, scientists sought to understand the atmospheric implications of tiny, highly irregular and chemically complex soot particles. The laboratory investigation, called the Soot Aerosol Aging Study (SAAS), examined the interactions of soot and a mix of other atmospheric particles using a unique suite of laboratory instruments. The team found that freshly formed soot particles with fractal-like shapes (a.k.a. morphology) become compacted after getting processed by a cold cloud, which affects their ability to absorb and scatter sunlight. Their modeling results showed that amount of sunlight energy reaching Earth's surface is ultimately influenced by the shape of soot. Why It Matters: From camp fires to coal-burning power plants, soot particles are ubiquitous. Their influence on clouds has been largely unexplored, hampering our understanding of their effects on the climate. This study shows that the morphological (shape) properties of soot particles should be included in future climate model simulations. The shape of soot particles, changed by their incorporation into cloud particles, affects how they absorb or reflect and scatter sunlight. This new information is important for climate models to correctly estimate the amount of sunlight energy that makes it to Earth's surface. This information will help the models correctly calculate Earth's energy in/energy out balance—important for understanding the climate—by taking into account the sway soot has over clouds. Methods: The PNNL-led research team began by producing ice crystals and supercooled droplets in the laboratory, and comparing them with fresh soot particles. They produced the soot particles using a diesel soot generator that was located outside of the Atmospheric Measurement Laboratory (AML) at PNNL. The team collected size-resolved particles from PNNL's environmental chamber and used them as seeds to spawn ice crystals and supercooled droplets within the ice nucleation chamber. The team then used the electron microscopy facility at Michigan Technological University to measure the morphological properties of soot particles and residuals from ice crystals and supercooled droplets. These highly magnified (and colorized) images of diesel soot particles show their shape and organization in three different stages of development. Fractal particles are freshly emitted diesel soot particles. Compacted particles are found in mixed-phase (both ice and liquid) clouds, commonly found in the Arctic, and were found within supercooled droplet residuals. Highly compacted ice crystal residuals are found in wispy cirrus clouds and in contrails. The samples were made from cloud-elements formed in the ice nucleation chamber at PNNL’s Atmospheric Measurement Laboratory and imaged with Michigan Tech’s transmission electron microscope. Graphic courtesy of the authors. The high-resolution images showed that soot particles from ice crystals are highly spherical compared to soot cores from super-cold droplets and freshly emitted sources. Later, the team modeled the optical properties of the particles that were inside the crystals and droplets to compare with fresh soot particles using a discrete dipole approximation model technique. What's Next? Particles that travel far from the source can change in the atmosphere. This study only investigated the morphology of freshly emitted soot. The atmospheric aging process could alter the morphology and may affect how well the particles are able to initiate (nucleate) cloud ice and water. The researchers suggest that further simulation studies should incorporate morphological features of aged soot particles. Sponsors: The Department of Energy's Office of Science sponsored the research as part of the Atmospheric System Research Program. The work was also supported by the National Science Foundation and several NASA agencies. Research Team: Gourihar Kulkarni, Mikhail Pekour, John E Shilling, Jacqueline Wilson, Alla Zelenyuk, Duli Chand, Alexander Laskin and Rahul A. Zaveri, PNNL; Swarup China, Noopur Sharma, and Claudio Mazzoleni, Michigan Technical University; Barbara V Scarnato, Naval Postgraduate School, Monterey; Shang Liu, Allison C Aiken, and Manvendra Dubey, Los Alamos National Laboratory. In one sentence: Researchers at Pacific Northwest National Laboratory found that highly irregular and chemically complex soot particles transform into compacted shapes under different atmospheric conditions, affecting their ability to absorb and scatter sunlight.